Welcome back! The long weekend is over, and it’s time for another Card of the Week. In this entry we’ll investigate a powerful Drill from Heroes & Villains. Orange Possession Drill has a wide range of applications. In a more control oriented deck, it quickly filters through dead draws and buys time to stabilize. In the late game, it can dig for kill cards and even enable a combo finish. Meanwhile, an aggressive build with a leaner suite of drills can still take advantage of the filtering ability. The ability to maintain threat density is essential to beatdown decks, and it still has the added bonus of intermittently generating raw card advantage. Finally, consider the synergistic interactions with cards like Orange Truck Lift or Krillin – Ready. Give it a try – just don’t deck yourself! 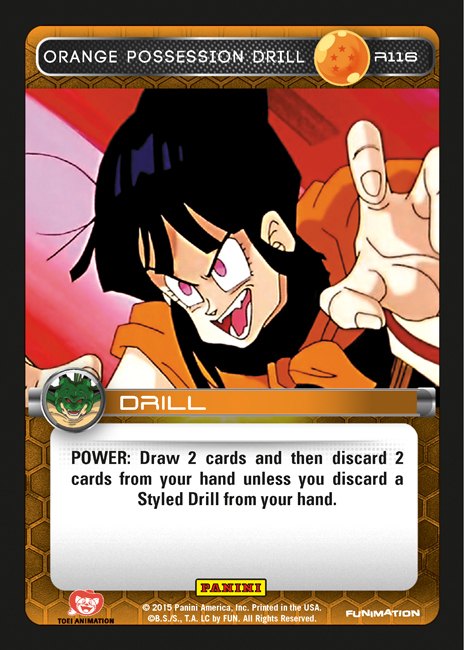 Could we get a card of the week for Saiyan Strength Test? One of the best things about set two was all the Orange cards that make Orange Krillin so playable.